Hundreds of people joined a march in Belfast on Wednesday, 8 April in support of the 210 Visteon workers sacked on 31 May. The staff, who had been employed by US motoring giant Ford until it set up spin-off company Visteon in 2000, were entering their second week occupying the west Belfast car parts factory site in protest at the companies’ breach of redundancy terms. When Ford spun the parts manufacturing operation off into a new company, called Visteon UK, in 2000, the workers were guaranteed “lifetime protection” – that their pay and conditions would “mirror” those they worked under at Ford under their new employment contracts with Visteon. But instead of getting the agreed 90 days’ notice for the redundancies, the workers got five minutes. While they are entitled to a minimum of 12 to 18 months wages as a redundancy payment plus pension in the event of a plant’s closure, the workers have now been told they can only claim statutory redundancy of about £9,000 pounds, and Visteon claims its pension fund is £150 million in deficit. On the same day that Visteon sacked its Belfast workforce, it also fired hundreds of workers at two of its plants in England. After seeing the Belfast sit-in on the news, the workers in Enfield, north London and Basildon, Essex, organised occupations and protests at their factory sites. Workers from Waterford Crystal, who began a seven-week occupation of their factory to save jobs in January, donated €5,000 to the west Belfast workers. Local representatives, trade unionists and the broader community have supported the west Belfast workers by bringing food and supplies and joining hundreds of people in a family fun day in solidarity on Sunday. Speaking at the fun day, MLA and MP for west Belfast Gerry Adams said: “Ford cannot be allowed to renege on its responsibilities to the Visteon workers. Workers’ rights must be protected. Adams has argued the workers’ case with John Fleming, chief executive of Ford Europe, and the New York City Comptroller’s office, which has investments in Ford. Administrators KMPG said it had been “assured” by Ford that the auto giant had “no liability” to the Visteon UK staff and that Ford and Visteon are two separate legal entities. A confidential internal Visteon document called Project Protea from May 21 2007 outlines the plan to shut down the Belfast plant. Many workers believe that after setting up Visteon UK as a “separate” company – which only made parts for Ford – the plants have been run into the ground, allowing Ford to set up shop or expand in states with lower wages while reneging on its obligations to its workforce here. In 2007 another company was set up, Visteon Engineering Services, which 400 mainly engineering and administrative staff were transferred to from Visteon UK. Conveniently, most of the management of Visteon UK transferred their pensions into this new company, which has not been affected by the demise of Visteon UK and continues to trade. Meanwhile, Visteon Corporation chief executive Donald J Stebbins took home US$1.48 million in cash and bonuses last year. The relationship between the web of companies around Ford and records of their financial dealings with each other are not available publicly. Unite is meeting Ford managers in New York on Wednesday for discussions about the redundancy terms. 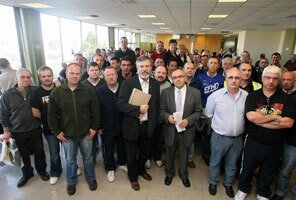 Union leaders said if the outcome of the talks is not satisfactory, the sit-in will continue.